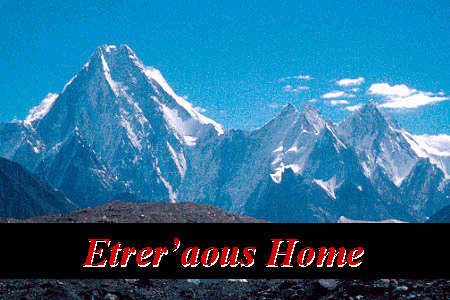 Welcome to the official webpage for the language Etrer'aous. Please enjoy and have fun becoming a part of it. If you are interested in learning the language, please check out the "Learn Etrer'aous!" section. Also check out the "Phrases, Sample Texts" section to wetten your curiousities on this language and what it's like. "Al'Karni Shamia. Naesh secondiul Etrer'aous fen. Tuli tafis me Khajan." Last Update: October 31st, 2002. 10/31/02 - Sorry about the lack of updates lately. This website will temporarly go into hybernation mode. This kneehab xp will only last for at the most a week. During hybernation mode it will go through lots of changes and then be updated. Get ready! PLEASE E-MAIL IF YOU'RE INTERESTED!!! 10/19/02 - Check out the new page added called: "Phrases, Sample Texts." It will be constantly updated with new phrases of things that you may want to know if you are taking a crash course on Etrer'aous. You will also find sample texts now and then. 10/18/02 - We got our first e-mail concerning my language today (he was asking for the numbers 1-10 in Etrer'aous). Due to the curiousity of number, I have decided to post the numbers 1-10 officially on this website. Please look for them under the "Samples and Phrases" page ... and thank you for e-mailing me, number guy, concerning the language ... it's good circulation! 10/17/02 - We are still getting more hits from the langmaker website, about people trying to see if insurance covers a brace but no one is e-mailing us to learn the language! Don't worry, if you are even SLIGHTLY interested, please, please e-mail us. See the "Learn Etrer'aous" section of this page for more information. 10/16/02 - Today I will try and get up the script samples, both in the scripting section and on this main page as a cool sample. We are seeing more traffic from http://www.langmaker.com/ , of course thanks to them for the link! Please sign up if you are interested or have any questions with learning or about Etrer'aous. 10/15/02 - I see we've gotten our first traffic from the LangMaker website ... a big thank you to them! A NOTE TO THE NEW VISITORS: If you come and are interested in this kneehab xp please feel free to e-mail us for more information about the language and sign up information (signing up is for free) at drewinterprises@hotmail.com. 10/14/02 - The geocities link has been posted on the geocities search engine and more traffic should be coming through here shortly. We hope to get some LEARNERS of the language to e-mail us soon so we can start up this language. Please notice that I have already (or will get to soon) post some more colorful pictures on this website soon. Enjoy!! 10/13/02 - We are almost completely up and running and working on getting more connections to the web. Please check out our website and seriously consider registering for FREE with ETRER'AOUS. 10/12/02 - Getting up and Running! Today, the "Learn Etrer'aous" section will be pasted along with a famous Etrer'aous quote, as seen above. Don't give up hope, though. This page will be up and running better than ever soon. PLEASE EMAIL ME IF YOU'D LIKE TO LEARN ETRER'AOUS ... see the "Learn Etrer'aous" page for information. 10/10/02 - Grand Opening! This marks the grand opening of Etrer'aous on the web. Although at first this site will be a little small, it will expand quickly and be fully up and running shortly. The pages that ARE currently up and running are: Speakers, Terms of Usage, About Etrer'aous, Learn Etrer'aous, and About Inventor and Contacting.